During her return trip from D.C., her head filled with all sorts of dynamic, innovative things that she was eager to see happen here, Harris excitedly texted her fellow aldermen and city staff to look into a program called Opportunity Zones. And then she got shut down. Time is short if the city wants to take advantage of Opportunity Zones benefits, Harris said. Applicant cities have until March 31 to apply or ask for extension from their state governors’ offices. City Development Services Director Jeff Ruggieri said he looked into it over a couple of days. The program left him underwhelmed, and in essence he shut down Harris’ push to have the program applied in New Bern. He said similar ideas have been around since 1980s under different names — Enterprise Zone, Freedom Zone, Promise Zone. Those programs had a lot of criteria attached, he said, mainly to create jobs, affordable housing, or both. He said reviews have been mixed on the Opportunity Zones and that this program has no criteria that he can find. It’s a fund set up based on deferred taxes for people who have capital gains, he said. “It’s kind an odd program at this point in time. The way I see it, there is nothing that says you need to create jobs. All these other ones say, here, you can go through this program, but you need to do something. You need to create low income housing, you need to create so many jobs. Can’t find any criteria with this program at all. “It seems kind of counter intuitively as it is applied. Since there’s really no stated goal, … there’s no goal of creating a low income housing or anything like that. The goal really is just to create money. Which can work, we can create projects that would work for something like this, but I don’t think we’re there yet. We really need a specific project and a very specific plan. Need a lot more infrastructure in place, human capital. A lot more capacity to really make this work. “It’s another incentive, another tool. We have a lot of tools in the tool box incentive wise, especially to apply in our Greater Duffyfield Area. Ruggieri said the best way to incentivize development and jobs in a community “is to do some really simple things. Create a safe place for people to live and children to play. Have great schools. Create inclusive transportation system. Sidewalks, safe public transportation. Create a great place to look at. Those things are really what works, and plenty of empirical evidence to support that. “This (Opportunity Zones) could be another tool, I just don’t see us using it yet,” he said. There are plenty of examples of “really simple things” that the city is rolling out around the city — just not in the Five Points area, Duffyfield or Dryborough. The only programs the city is actively pursuing in those areas is the demolition of dilapidated buildings and the foreclosing of distressed properties the city in turn has been selling at a loss of thousands of dollars per property. In short, the city’s efforts in those parts of town are failing. A program like Opportunity Zones, which seek private investment, may succeed where the city has failed. Only problem is that, because it lacks criteria, it would be hard for City Hall to control Opportunity Zones investments. Harris was a first-time attendee at the National League of Cities conference, learning information and interacting with peers from across the nation. She mentioned another program on Tuesday, Race Equity Leadership Initiative. She said it provides grant money for a consultant to come out and assess whether the community is diverse. That’s a program that really does seem to serve no purpose. The answer is obvious: New Bern has an ethnically diverse population but an ethnically segregated social structure. Check out the local country clubs and golf courses and count the number of non-white faces you see there (other than the employees). Stroll through downtown and count the number of non-white faces you encounter. Ask the Chamber of Commerce what percentage of its members are non-white. Go to church on Sundays and look at the congregations. Drive through Trent Woods and River Bend, then Duffyfield, Dryborough and James City. How many African American students attend Epiphany School or many other church-based schools in this community? How many of New Bern’s public elementary schools are ethnically diverse? Diversity actually does exist somewhat in New Bern’s major retail stores (most notably Wal-Mart) and restaurants (RIP Golden Corral). Many workplaces in New Bern are diverse (again, Wal-Mart). But overall, New Bern has a long way to go. Opportunity Zones may not fit the mold that City Hall is creating for its vision of New Bern, but maybe that’s exactly what it needs if it is going to fix Duffyfield, Dryborough and Greater Five Points. 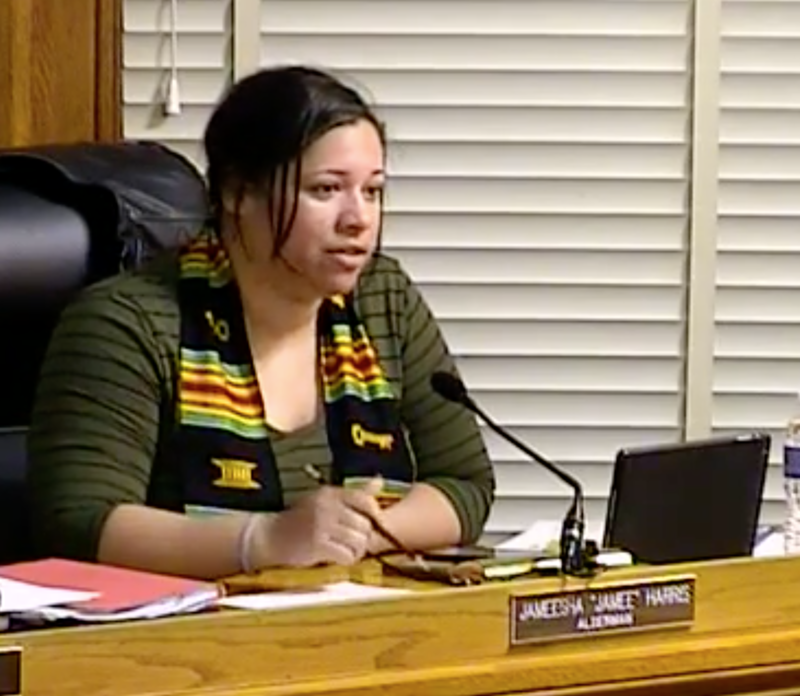 Jameesha Harris is a new, young member of the Board of Aldermen. She has much enthusiasm for making this city better. It’s a pity that no one in the city encouraged her idea for improving New Bern. The idea described here, if implemented, could make a big difference in the area around the intersection of Broad and Queen streets. The city needs to move forward with a plan for improvement in that area. Jameesha appears to be working hard to make that happen. Some of the others should be following her lead. Hard work is admirable. But what real-world experience getting things done in government does Mrs. Harris bring to the New Bern Board of Aldermen?